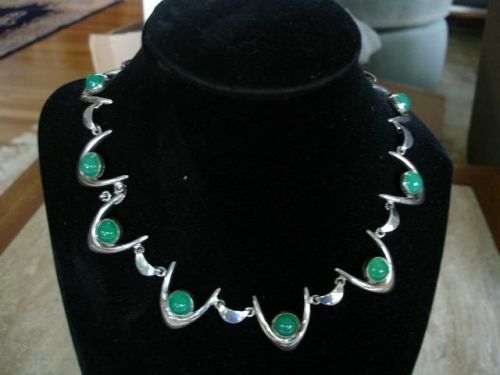 Fabulous Arne Johansen Denmark rare Boomerang Modernist Necklace in Sterling Silver accented with fabulous Chrysoprase Cabachones. Measures 15 3/4 inch long and about 1 inch width. Hefty 54 grams. This is one of those pieces that the back is nearly as beautiful as the front and it has an amazing fluid feel. Other than some light tarnish in very good condition. Hallmarked Denmark AJ 925s.